who have dedicated their lives to help keep us free. Free to say out loud on a mountaintop (or in writing) how much I love my country, my freedom, and how much I love my GOD. Free to worship and publically attend church in safety, work as I desire, free to travel when I care to, free to have many children, free to express myself.....such blessings. I am so thankful, words can't express it. There are so many who have no freedoms. We must always be aware of that, and strive to keep this hard-fought freedom. Be vigilant always! Be knowledgeable and aware of history and of current news. History has a terrible way of repeating itself. Many give George Washington most of the credit of starting us on the right foot- and, granted, he was one incredible General - brave and a great and powerful respected leader......but it was really John Adams who had the truest courage, foresight and leadership to lead us to become our own government....courage to stand up against contemporary adversity for what was RIGHT when standing mostly alone in his true fight for our Independence. But a constitution of Government, once changed from Freedom, can never be restored. Liberty, once lost, is lost forever. I highly recommend the HBO series "John Adams" if you haven't seen it yet. It is a remarkably done mini series based on David McCullough's Pulitzer-prize winning book. It stars the brilliant actor Paul Giamatti as John Adams and EVERY American family should watch this! It is done so well- not a boring history lesson, trust me - it is a must see for ALL AMERICANS! It should be played in every single American school - but alas, it is the young who are the most clueless - mostly through no fault of their own. Truths aren't being taught in the school as should be. So we need to do it at home now more than ever. in the principles of freedom. And of course what tea is complete without a hat? of our beautiful flag of RED WHITE & BLUE! Thank you for visiting - and indulging me my passion for freedom. to stretch your wings and soar like an eagle. Amen! Michele, I agree with you! 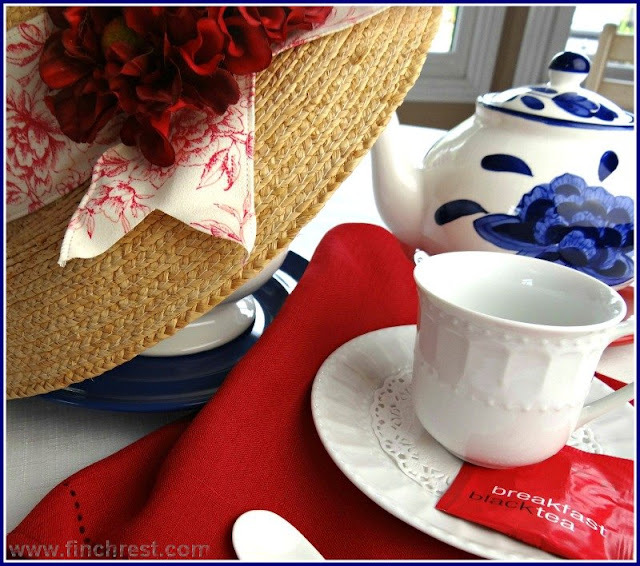 Your Tea is set so pretty for Tea this morning and I love the hat! Have a great 4th! Have you read the 'Prelude to Glory' series yet? Beautiful setting! Yes, we really need to teach our kids as well as remind ourselves why we are celebrating! Happy 4th to you! What a pretty table set for the 4th of July! I don't have HBO... I feel that, from last year to this year, I have spread my wings more than I ever have. Your comments are always so appreciated, my friend! And give me courage to spread them even farther. I don't have HBO either! We rented the series from Netflix! What a wonderful post, Michele! I am a Canadian but I agree with you about all the freedoms we enjoy in both our countries. I thank God for those freedoms! 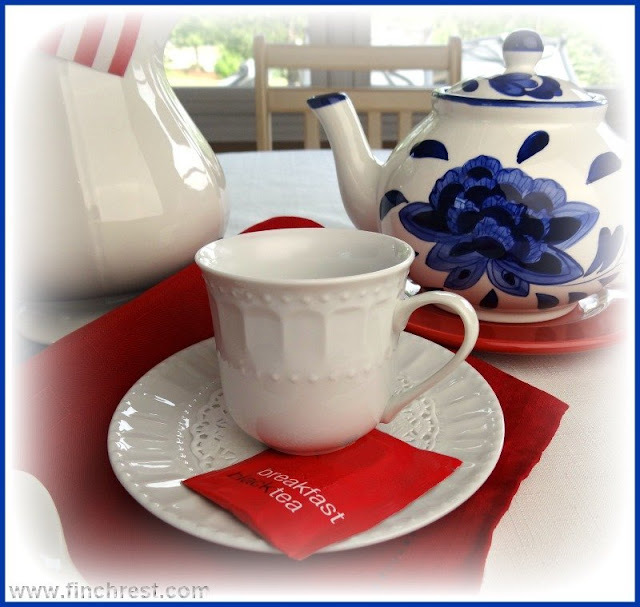 That is a cute teacup and the colours of your setting are very red, white, and blue. But you know what I like most of all? Your HAT! Love it!! 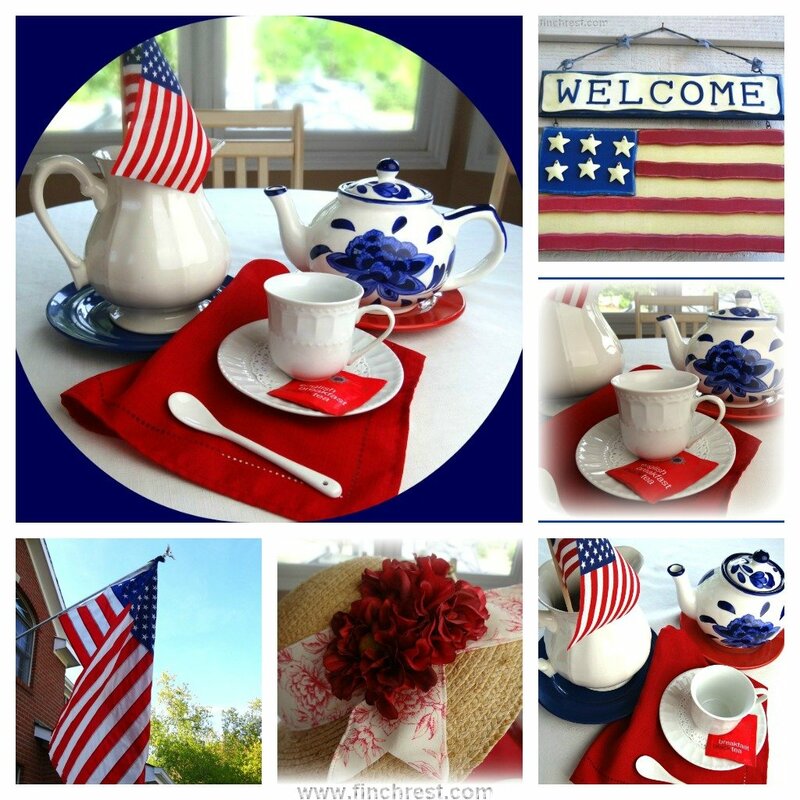 Thank you for joining me for tea and Happy 4th of July to you and your family! 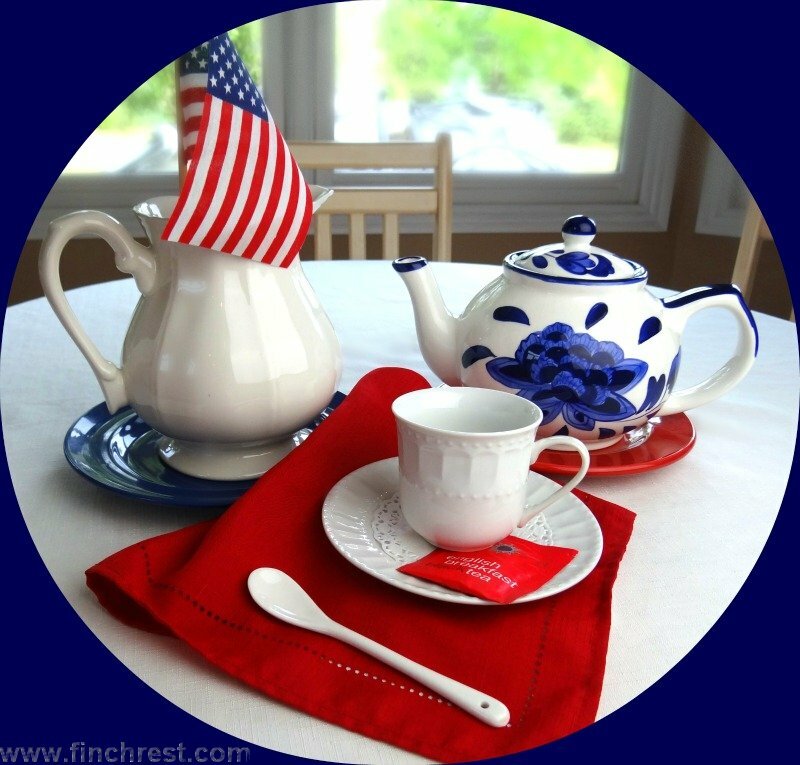 A very nice patriotic post and tea table. Wishing you a happy 4th of July. Awesome post,and I agree about the HBO series "John Adams". I was so amazed at just how important he was in the founding of our country and that he knew he wasn't popular and encouraged Jefferson to write the Declaration of Independence. Amazing! I'm so afraid that the story of our country is becoming lost and I dread to think what will happen then. Thanks for your lovely post and vignette. Happy Independence Day! Oh, forgot to say that I'm happy to be your newest follower. 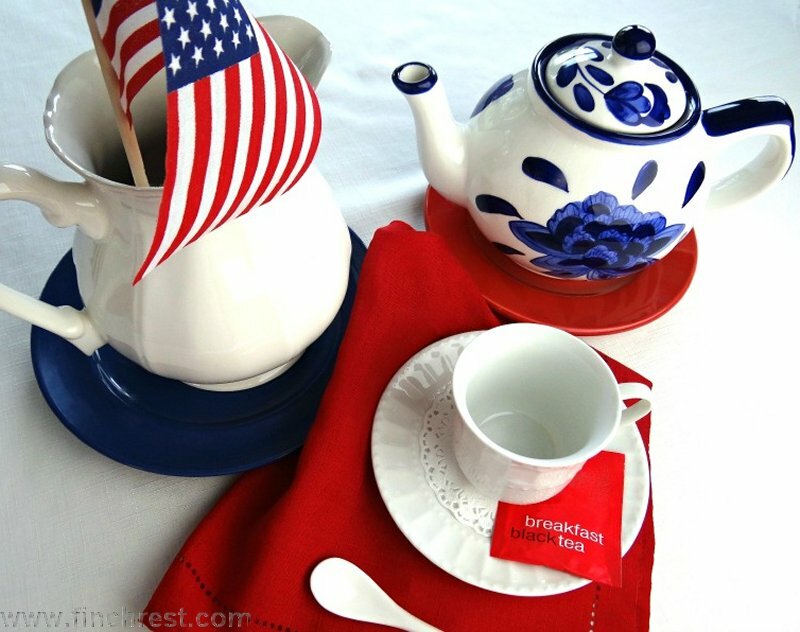 Lovely patriotic tea of red white and blue ... cool hat too. I love the Adams book .. one of my favorites of all time. 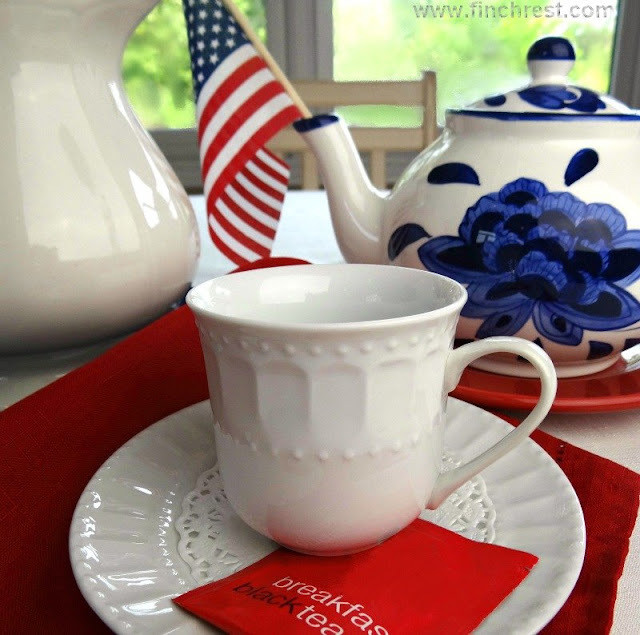 Happy 4th of July and Happy Tea Day! You couldn't be more right, Michele. 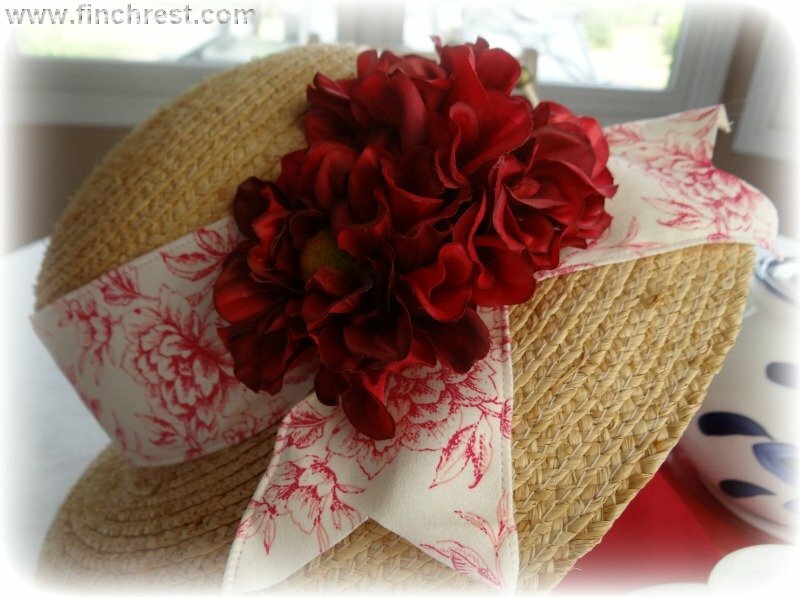 I would love to sit down to tea wearing that pretty hat! I love your post for the 4th.of July... The colors are great. I hope you your family have a wonderful day. That was so well said, Michele, and so heartfelt!! Thank you for sharing your beautiful words. I have not seen the series on John Adams, but I hope to. Beautiful post, Michele. Being a neighbour from the north, we celebrated our special day on July 1st. Wishing you and your family a safe & happy July 4th. Hello Michelle, This is so well put. We do have to be vigilant! Our freedoms are eroding without people realizing it. Your tea setting is so beautiful - love the hat - so glad you weathered the severe storm well. I was listening to the Atlanta radio station and heard of the strong winds and rain there - amazing power! Thanks for sharing this beautiful post. Happy 4th of July! Happy 4th of July to you Michele ! Your photo's a lovely and the colours happy and bright. Yes I have read The Forgotten Garden quite a few years ago. I have also read her other book but the name escapes me for the moment. They are both brilliant ! I'm pretty sure the author is a fellow Aussie. Kate Morton is an Aussie- you are right, Mel. My daughter (who told me about this book) said the other book called THE HOUSE AT RIVERTON is another wonderful read! Lovely vignettes and lovely and important message. of christian movies, so maybe they will have this one too. Hope so. They do, Nellie - that's how we watched it- we don't have HBO either. A wonderful post, Michelle. We have so many freedoms to be grateful for. God has blessed America, and may He continue to bless America. Thanks for a wonderful post! Amen....amen.....and oh....amen :) Thanks for making me so proud to live in an incredible country like this! Love your pretty teatime vignettes. Hope you had a lovely celebration. Michele I love this post. I too am so thankful for the freedoms that we enjoy. May we never take them for granted or forget those who have died to save our rights and freedoms. We watched that mini series and I loved it. I really learned alot. Your post is a great tribute--thank you for sharing it!